loony toons | what the fwaah? We all as humans have found ourselves looking up to the heavens. Wondering, trying to comprehend what kind of cosmic forces could have come together in such perfect harmony quite like the NBA and animation powerhouses of the 90’s to create the breathtakingly complex, Space Jam. But what is the Big SJ really? Well it’s a vehicle of supreme high life 90’s nostalgia racing around the hearts of every twentysomething whether they know it or not. A little bit of Space Jam lives in all of us. Michael Jordan is simply the greatest basketball player ever to walk (or perhaps AirWalk…) the earth, and to AirWalk into our hearts. Yeah…. Go ahead and say that you wouldn’t, we all know you would. Through the eyes of the SJ camera Michael Jordan was forever revered as the king of the basketball court. His biggest critics may try to remember MJ as a ball-hog trash-talker instead of a team leader; the centerpiece in the legacy of the late 90’s Bulls; or try to make it seem MJ couldn’t let a good thing like six rings, come to a clean end after Jordan’s admittedly feeble attempt at a comeback, (to get a seventh ring to go with his six rings,) with the Wizards from ’01 to ’03. People holding these sentiments chip away at the pure ivory (ebony?) statue of basketball history he left behind. However Jordan holds over nineteen thousand NBA records including (but not limited to): six rings, the highest career regular season scoring average, best bod, and winner of the Michael Jordan look-alike contest fifteen years in a row. For real, he has six rings. The Loony Toons are an almost equally powerful force of good as MJ. Bringing laughter, clean slapstick humor, and silly hijinks with significantly less racist overtones than Disney for decades. This movie has never been officially released… do you really wonder why? The Loony Toons have always been a good for a solid chuckle or a thought such as, “I didn’t know you could put a frying pan there…” or “That cat REALLY wants that mouse for something…” But “What is Space Jam?” is a bigger question than what one may initially think. As I did some research into the question looking past the surface, I came across several shocking revelations that really shook me to my core. 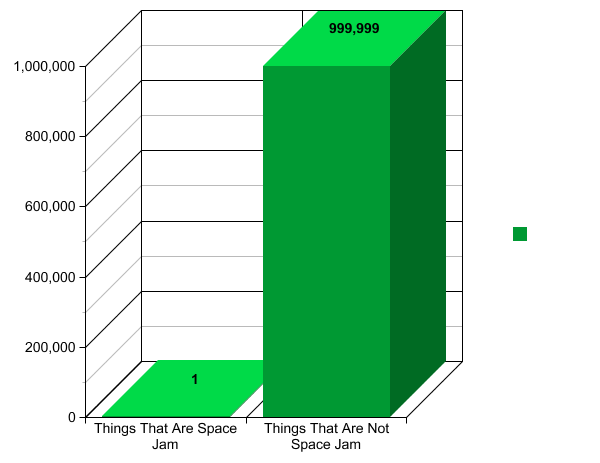 Upon researching many sample populations, data points, and scholarly articles, I was struck with the shock and horror that not everyone has seen Space Jam. My future children can expect to be exposed to Space Jam approximately ten seconds after relocation from the womb. It will be the easiest transition from a life of warm comfort and satisfaction into this desolate wasteland of a planet… a desolate wasteland that’s brightest shining light is the wonderment that is Space Jam. 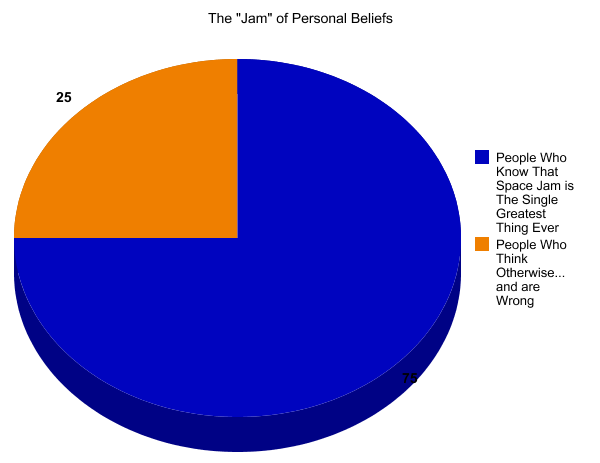 Despite these FACTS of life, people are still non-believers in the beauty of “The Jam.” I compared a million things, compiled the data, and was shocked to find these results. If you have seen Space Jam, you know this follows logically. This is horrific and terrifying. This makes me feel sad and scared for our county’s future. There are people likely running for office that have never had an opportunity to lay witness to a confrontation between the ToonSquad’s array of colorful, Warner Bros. branded, basketball warriors, and the once small, kinda powerful aliens from outer space who are just a general annoyance, the MonStars. How can so many live what they believe are to be happy lives when they haven’t experienced that moment when the belief of your ability to fly overcomes all obstacles. 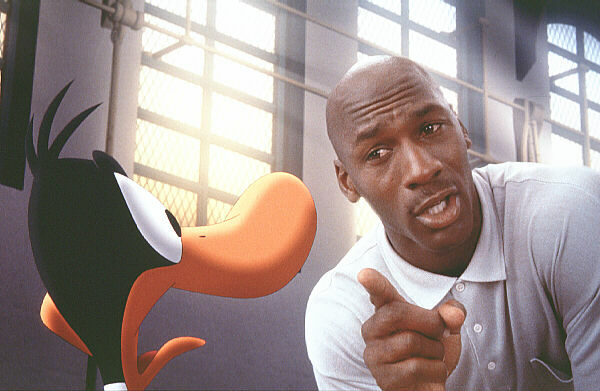 So remember kids… Friends don’t let friends live a Space Jam-less life. Let’s see if we can build a better tomorrow, today. With daffy too. MJ imparting some of his timeless wisdom upon one lucky duck.